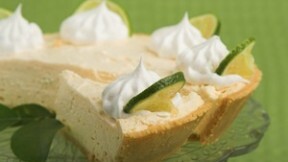 Key Lime PIe is an American dessert that originated in Key West, Florida. Combine milk, sugar, egg yolks and lime juice in a mixing bowl. Whip by hand until smooth and sugar has dissolved. Pour mixture into pie curst. Fill to the rim being careful not to spill over the edge. Place pie in oven and bake for approximately 30 minutes, or until center is firm. Remove from oven and place in refrigerator. Meanwhile, place the cream and powered sugar in a mixing bowl. Use an electric mixer to whip on high speed until very stiff. Take chilled pie out of the refrigerator. Place whipped cream in the center of the pie and spread to the edges of the crust. The whipped cream in the center of the pie should be equal in depth to the filling and taper off to the edges of the pie. If desired, grate the skin of a lime over whipped cream.